During my recent participation in My Selangor Story 2013 programme, I stayed at 4 different hotels, namely Premiere Hotel (Bandar Bukit Tinggi, Klang), Arenaa Stars (Kuala Lumpur), Golden Palm Tree Iconic Resort & Spa (Bagan Lalang, Sepang) and Vivatel (Kuala Lumpur). The following is my review of Golden Palm Tree Iconic Resort & Spa. Golden Palm Tree Iconic Resort & Spa is a 5-star resort that is located in a small town in the district of Sepang, close to Kuala Lumpur International Airport and Sepang F1 International Circuit. There was a small welcoming ceremony which also includes a local dance when our bus pulled over to a stop in front of the resort. We were welcomed with cold towel and refreshing signature drinks at the reception area. Guests can use a buggy to travel between the lobby and the Club House as well as the villas. The resort has almost 400 villas ranging from 52 square meters to 232 square meters in size. There are five different types of villas - Travelers, Premier Travelers, Canary, Ivory and Royale. The four of us were given a Canary Palm Villa, a 2-bedroom villa complete with 2 bathrooms and a living room as well as a balcony for each room. The villa and the rooms are spacious and roomy, complete with bedside tables, sofas, a working table, a coffee table and wardrobes. The room has tea/ coffee making facility, a telephone, an LCD TV, a safe box, a minibar and a hairdryer. The mattress and bed are very comfortable. Linens and towels are okay. The bathroom (shower & bath tub/ sunken baths) ranges from very good to very huge in size depending on the types of villas. Toiletries are provided. Overall the villas and the rooms are well furnished and comfortable and should be good for both business and leisure stay. Although the resort is geared more towards a getaway holiday, it also offers MICE facilities. Breakfast is served in Bila-Bila Restaurant in Club House. Breakfast selection is quite good. It includes local as well as standard international breakfast fares. Internet access is available for free via Wi-Fi at the hotel lobby only. Access to internet in villas is via land line. Apart from restaurants, the hotel has an infinity swimming pool, a gym, a spa, and Extreme Park. The resort has 7 in-house restaurants and cafes called Bila-Bila, Hai Sang Lou, Buloh Bar, Perahu Restaurant, Stimbot Restaurant, Sepoi-Sepoi Cafe and Selat Bar. There are also several food stalls along the beach near the resort. You'd need your own transport to get around. If you don't however, your options would be either hotel shuttle service or possibly taxi. 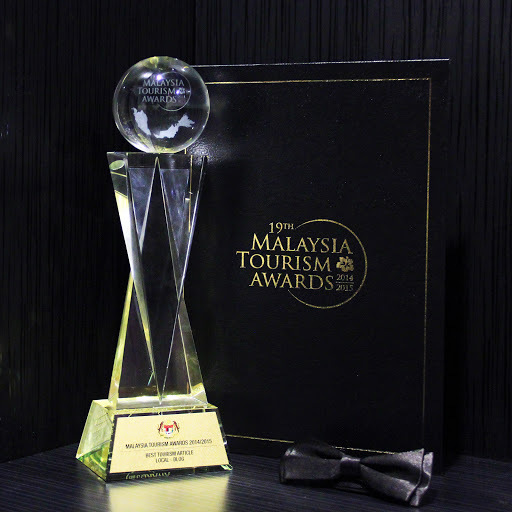 I would like to thank Tourism Selangor and the organiser for My Selangor Story as well as the management of Golden Palm Tree Iconic Resort & Spa for the arrangement to stay at the hotel. The stay was sponsored as part of My Selangor Story 2013 programme. The sponsorship however has in no way affected my review of the hotel. I'd love to try the infinity pool! It looked so inviting when we were there.